Estimation of placenta thickness in third trimester to determine fetal weight in Sudanese women 2016. Objective: This is a prospective descriptive hospital-based study about relationship between placental thickness and estimated fetal weight in third trimester pregnant Sudanese ladies at Omdurman Maternity Hospital (Sudan). Methodology: The study group included 207 women randomly selected. In this study we want to study the normal thickness of placenta among Sudanese pregnant ladies ultrasound growth parameters used for fetal weighing are Biparietal Diameter (BPD), Femur Length (FL) The Abdomen Circumference (AC). Measuring placental thickness in (cm) at the level of cord insertion site, along with these parameters could be of great value. The patient was scanned in supine position with a moderately distended bladder. Result: there is a strong correlation between placental thickness and bi parietal diameter, femur length, abdominal circumference, and so with the estimated fetal weight. The measurement of placental thickness showed the maximum thickness 4.3 cm, the minimum thickness 1.5 cm, the mean of placental thickness 3.1 cm, the median of placental thickness 3.1 cm, the stander deviation 0.64111 and every 1 cm of placental thickness increase fetal weight by 0.88 kg. We conclude that fetal weight and age can be determined by measuring placental thickness. Placenta is concerned with the exchanges that occur between the maternal and fetal organisms, which consist of two basic components: the maternal and fetal portions. Around the 4th week of pregnancy, Placental function begins, with the formation of the first anatomical elements necessary to ensure physiological exchanges . The normal function of placenta reflects on normal fetal weight, and subsequent normal birth weight . So that normal placental development during pregnancy is necessary for a healthy fetus . Placenta can reflect the fetus situation, and any abnormalities can be indicated by an abnormal placental size during third trimesters. Growth restriction is indicated by small placenta. More than 5 cm before 40 weeks are considered abnormal . Beside that large placenta may indicate an infection, anemia or Triploid . Thickened placentas, suggest Primary maternal Cytomegalovirus infection and fetal disease . Increased mortality rate related to fetal anomalies and higher rates of both small for gestational age, and large, for gestational age infants at term also related to Thickened placentas . Growth retardation is associated with Placental thickness of less than 2.5 cm. while Diabetes Mellitus, fetal hydrops and intrauterine fetal infections is associated with thick placentas . The gestational age is estimated by using Ultrasonography (USG) to measure the Bi parietal Diameter (BPD), the Abdominal Circumference (AC), the Head Circumference (HC) and the Femur Length (FL). We use the BPD measuring in great care because BPD not reliable in the fetuses which had a premature rupture of the membranes . The Placental thinning has been described in systemic vascular and hematologic diseases that result in micro infarctions. Placental thickness and volume have been used to predict chromosomal anomalies and diseases such as preeclampsia  Thalassemia and other complications of pregnancy . Placental thickness is very much related to fetal development and may be a key in perinatal outcome. We did this study to introduce other parameters for accurate diagnosis of fetal gestational age and weight. This is a prospective descriptive hospital-based study about relationship between placental thickness and estimated fetal weight in third trimester pregnant Sudanese ladies at Omdurman Maternity Hospital (Sudan). The study group included 207 women randomly selected from normal Sudanese ladies in their third trimester coming for routine antenatal care during the study period. Selection criteria were, singleton pregnancies, 27- 40 weeks, sure of her last menstrual period, confirmed by early ultrasound. Any lady with medical disease, multiple pregnancy, placenta Previa, polyhydramnios and oligdhydramnios, or fetal anomalies excluded from the study. The data was collected by a coded direct interview questionnaire. The pregnant ladies was examined in the supine position, we apply the coupling gel. Then fetuses were scanned, and the gestational age was estimated using growth parameters (BPD), (FL) and (AC). The composite average of the gestational age estimation by the growth parameters ((BPD), (FL) and (AC)) was taken for each fetus. Alpinion E-CUBE-7(Hyundai) made in Korea is ultrasound machine used. In this study the ultrasound machine formula for estimation fetal weight was devised by Hadlock II basis of biparietal diameter (BPD), femoral length (FL) and abdominal circumference (AC). The patient was scanned with a moderately distended bladder in supine position. At the level of cord insertion site the placental thickness in cm was measured. For the accurate measurement it’s important to proper identification of the cord insertion site. The ultrasonic look of the cord insertion seems either as hypo echoic areas nearest to the chorionic plate in the thickest portion of the placenta. The calculation of the Placental thickness was done from the echogenic chorionic plate to placental myometrial interface. The myometrium and sub placental veins will be excluded in these measurements. As the contractions of the uterus can spuriously increase the placental thickness, all placental measurements was taken during the relaxed phase of the uterus. The thickness will increase throughout contraction because of distension of intervillous areas by maternal blood. The length and surface of placenta may also increase because of distention of intervillous space. Placental thickness depends on quantity of fetal blood, maternal blood and placental tissue. This study was done at Omdurman maternity hospital in period from august 2015 to February 2016 on 207 of pregnant women in their third trimester who fulfilled the inclusion criteria which were included on this study. The demographic characters of study group mentioned in Figure 1. Most of the women, 53.1%, their age is between 21-30 years, 29.5% their age between 31-40 years, 13% their age between 15-20 years and 4% their age more than 40 years. Half of the women 54.1% were multipara, 31.9% were primigravidas and 14% were grandmultipara. Posterior placenta was found in 29.5%, 29% anterior placenta, 26.1% fundal placenta and 15.5% lateral placenta. The maximum body mass index 40 and the minimum 18 and the mean 29.5 and stander deviation 4.7 Their average gestational age by ultrasound scans was 34.7 weeks, the maximum age 40 weeks, the minimum age was 26 weeks, their mean 34.69 weeks, their median 36 weeks and their stander deviation 0.23910. Their estimated fetal weight by ultrasound scan the maximum estimated fetal weight was 3.9 kg; the minimum estimated fetal weight was 1kg, their mean 2.64 kg, their median 2.7 kg and their stander deviation 0.65477. The measurement of placental thickness showed the maximum thickness 4.3 cm, the minimum thickness 1.5 cm, the mean of placental thickness 3.1 cm, the median of placental thickness 3.1 cm, the stander deviation 0.64111. There is correlation between placental thickness and parity the Pearson correlation was 0.076 and is significant at p value 0.05. There is no correlation between placental thickness and body mass index the Pearson correlation was 0.169 not significant. This study showed strong correlation between placental thickness and average gestational age estimated by ultrasound scan the Pearson correlation was 0.74 which is significant at p value 0.01 the correlation between placental thickness and femur length is highly significant. The Pearson correlation was 0.725 and the significant at p value 0.01. There is significant correlation between placental thickness and biparietal diameter, the Pearson correlation was 0.730 significant of p value 0.01, with abdominal circumference. The Pearson correlation was 0.735, significant of p value 0.01, and with estimated fetal weight by ultrasound scan the Pearson correlation 0.869, significant of p value 0.01. Placental thickness predictors correlation (r)=0.869 and r squared=0.756. 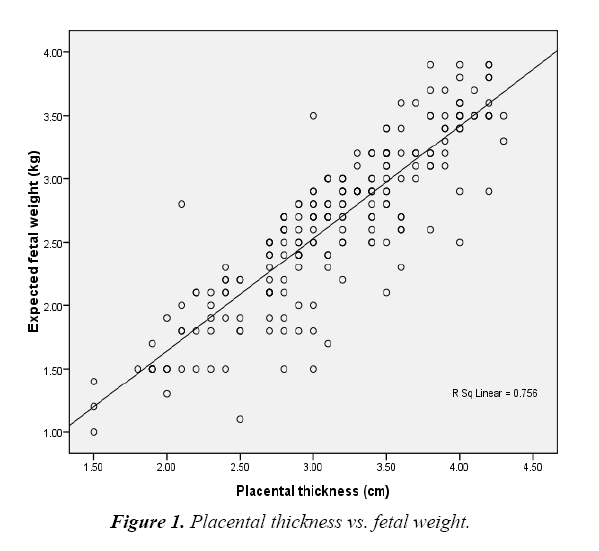 Figure 1: Placental thickness vs. fetal weight. So every 1 cm of placental thickness increase fetal weight by 0.88 kg (Figure 1). This study is to correlate relationship between placental thickness and estimated fetal weight in normal Sudanese pregnant women on their third trimester. The study include 207 pregnant women in their third trimester the data was collected from Omdurman maternity hospital from September 2015-february 2016 the data analyzed by statistical package of social science (SPSS).The placental thickness PT, bi partial diameter BPD, femur length FL, abdominal circumference AC, average gestational age and estimated fetal weight were measured. Other variables such as maternal age, parity and body mass index also included in this study. This study showed that there is linear relationship between placental thickness and average gestational age and there is strong positive correlation between them(r=0.743) with probability (p=0.01) as shown in Figure 1  this result establish that there is increase in placental thickness (PT) with increase fetal age which is typically go with those study done by Abu et al. on Nigerian women and Arafa , and Alsafi , on Sudanese women. Our study found there is strong positive correlation between placental thickness (PT) and bi partial diameter (BPD (p=0.01)), Femur length (FL (p=0.01)) and abdominal circumference (AC (p=0.01)) respectively. Femur length the correlation (r=0.725) with (p=0.01). The placental thickness and bi partial diameter (BPD) (r=0.730) with (p=0.01). The placental thickness and abdominal circumference (AC) the correlation (r=0.735) with (p=0.01).this mean that four parameter increase together and increased with fetal gestational age this same result was given by (Aarfa)  and Alsafi . The study showed there is strong positive correlation between placental thickness and estimated fetal weight (r=0.869) with (p=0.01), rather than that result of Abu et al. on Nigerian women which found there is positive correlation between placental thickness and estimated fetal weight on third trimester (r=0.570) with p=(0.05). We found in this study every 1cm increase in placental thickness increase fetal weight by 0.888 kg. Also the study found the placental thickness on third trimester Sudanese ladies range between (1.5-4.3 cm) and its mean (3.1 cm), and this go with Alsafi  and Abu et al. and both of them founded the maximum placental thickness was (4.5 cm). The study found there is no correlation between placental thickness and maternal age(r=0.151) with (p=0.05). The study also found there is no correlation between placental thickness and parity (r=0.076) with (p=0.05). Also the study found there is no correlation between placental thickness and body mass index(r=0.169) with (p=0.05). The study found that there is positive correlation between placental thickness and average gestational age. And there is positive correlation between placental thickness and bi partial diameter (BPD), femur length (FL) and abdominal circumference (AC) respectively. Also the study showed linear relationship and strong positive correlation between placental thickness and estimated fetal weight and both increase with fetal age. We found in this study every 1 cm increase in placental thickness increase fetal weight by 0.888 kg. So fetal weight and age can be follow by measuring placental thickness. We suggest that sonologist use the placental thickness as parameter to estimate fetal weight and age in addition to other parameter. More training of obstetrician on estimation of fetal weigh and placental thickness by ultrasound. Further study to correlate blood supply of the placenta and fetal weight using Doppler ultrasound, and also further study should be done on the placenta to understand the early process that (program) adult life. Moore KL. The placenta. In: Moore KL, Persaud TVN (eds. ), The developing human: Clinically oriented embryology (7th edn). WB Saunders, Philadelphia. 1993;110-8. Azpurua H, Funai EF, Coraluzzi LM. Determination of placental weight using two-dimensional sonography and volumetric mathematic modeling. Am J Perinatal. 2010;27(2):151-3. Salafia CM, Zhang J, Miller RK. Placental growth patterns affect birth weight for given placental weight. Birth Defects. Res Clin Mol Teratol. 2007;79(4):18-28. Smith NC, Smith APM. Obstetric and gynecological ultrasound made easy (2nd edn). Elsevier, London. 2006;123. La Torre R, Nigro G, Mazzocco M, et al. Placental enlargement in women with primary maternal cytomegalovirus infection is associated with fetal and neonatal disease, Clin Infect Dis. 2006;43(8):994-1000. Elchalal U, Ezra Y, Levi Y, et al. Sonographically thick placenta: a marker for increased prenatal risk-prospective cross-sectional study. Placenta. 2000;21(2-3):268-72. Ohagwu CC, Abu PO, Ezeokeke UO, et al. Relationship between placental thickness and growth parameters in normal Nigerian fetus. Afr J Biotechnol. 2009;8(2):133-8. Mital P, Hooja N, Mehndiratta K. Placental thickness: a sonographic parameter for estimating gestational age of the fetus. Indian J Radiol Imaging. 2002;12(3):553-4. Hafner E, Metzenbauer M, Hofinger D, et al. Comparison between three dimensional placental volume at 12weeks and uterine artery impedance and notching at 22 weeks in screening for pregnancy-induced H.T., pre-eclamsia and fetal growth restriction in a low-risk population. Ultrasound Obstet Gynecol. 2006;27:652-7. Kinare AS, Natekar AS, Chinchwadkar MC, et al. Low mid- pregnancy placental volume in rural Indian woman; a cause for low birth weight. Am J Obstet Gynecol. 2000;182:443-8. Arafa Ahmed, Alrashid Rahim, Hamid Osman, et al. The correlation between placental thickness and fetal age among the pregnant in Sudan. Sch J App Med Sci. 2014;2:395-8. Abu PO, Ohagwu CC, Eze JC. Correlation between placental thickness and estimated fetal weight in Nigerian women. Ibnosina J Med Bs. 2009;3(ID):80-5. Elsafi AAB, Magdolein SA, Caroline EA, et al. Prediction of fetal growth by measuring the placental thickness using ultrasonography. J Gynaecol Obstet. 2014;2:26-31.